You likely have heard that a hoard of college kids invade South Padre Island during their Spring Break. 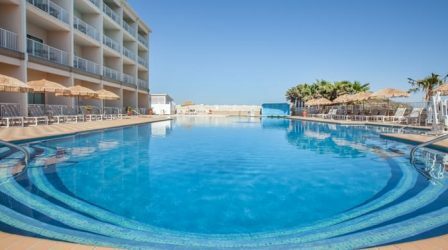 But the rest of the year this narrow strip of land at the far southern edge of Texas is a perfect vacation spot for girls’ getaways, couples, families and retirees looking for a new destination. Picture blue-green water to sooth the soul, glistening sand for a sunrise walk, terrific Mai Tais, Martinis and Margaritas to sip at sunset and yummy seafood for lunch and dinner. 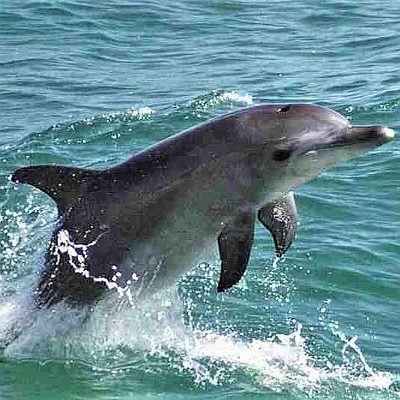 For a change of pace there are cruises to see bottlenose dolphins, kite boarding to move with the breeze and sand castle building lessons to find your inner architect. All those experiences (except for the kite boarding which maybe I’ll try next time) made my really brief visit to South Padre Island (often referred to as SoPadre), a memorable vacation. I had heard of the destination but what spurred me to visit this fall was United Airline’s decision to fly from Chicago nonstop to the Brownsville International Airport on Saturdays. The airport is a mere 30 minute drive or shuttle ride away. After arriving at the Hilton Garden Inn which has an airport shuttle, the first thing I did was step out onto the patio to inhale the warm air and collapse on a chair to gaze at the pool, greenery and gulf. Time out really means something on South Padre. Second, was to don a bathing suit (unpacking could wait), dip a toe into the pool, relax in a cabana then begin to think about dinner. Vacationing on the Gulf of Mexico is a chance to indulge in shrimp, crab, scallops, oysters and fresh fish. 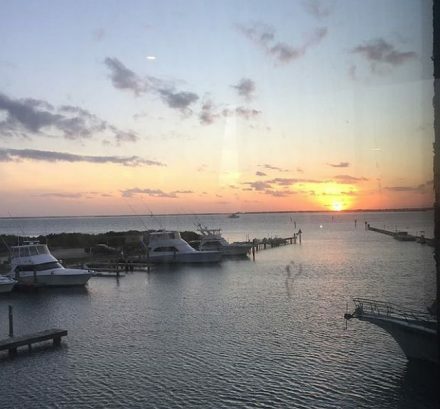 But what surprised me after three days of trying different, preparations for lunch and dinner at different restaurants was how good the food is on the island and Port Isabel which is just across Laguna Madre Bay. Pier 19 had a terrific shrimp basket. Pirates Landing had a wonderful shrimp and oyster po’boy. I learned not to judge by appearance. The elongated shacks that make up Pier 19 attract the locals and the commercial looking Pirates Landing has good shrimp and salads. Pier 19 was also well placed to take an Osprey nature and dolphin cruise on Laguna Madre Bay. Watching dolphins slip in and out of view was fun but the crew also emptied a net into a tank so that passengers could see and touch what was swimming in the bay. While waiting to board it was fun to watch the kite boarding on the other side of the pier. Kites, period, are popular in the South Padre area.. B&S Kites is worth stopping just to say OMG when seeing their huge, wonderful shapes hanging from the ceiling. It’s also fun to watch people try to control these large kites on the beach. What looks deceptively easier is building a sand castle worth of Disneyland. 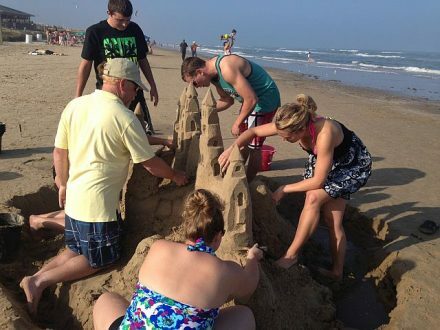 Playing in the sand isn’t just for kids on South Padre. Sand castle lessons are actually advertised on the island’s tourism site. A group of us staying at the Hilton booked a sand castle lesson with “Sandy Feet,” an expert sand sculptor who used common silverware tools. We learned you don’t have to be among the kindergarten set to enjoy creating a sand castle. What fun and a good way to work up an appetite for dinner! I had already enjoyed red snapper at Sea Ranch so went for sophisticated dining at South Padre’s new, upscale F&B SPI (Food and Beverage South Padre Island). Both restaurants have terrific seafood appetizers and fresh fish. But I also loved the desserts (which I never order when home) at F&B. Before returning to Chicago, I had to visit the island’s famed Sea Turtle Inc. sanctuary. So the next day I heard an excellent talk and saw some rehabilitated turtles swimming in tanks. To see Allison and Gerry, two Atlantic sea turtles, visit the center’s web cam. 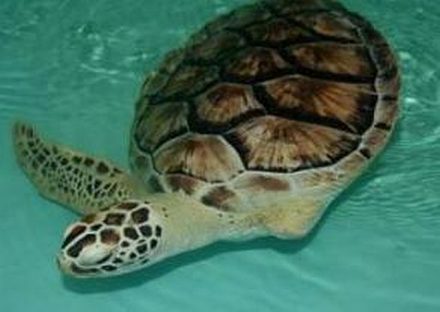 South Padre Island is a major turtle protection and rehabilitation area. Alerts go out when baby turtles that their moms buried in the sand for protection start hatching and are guided into the gulf by staff and volunteers. 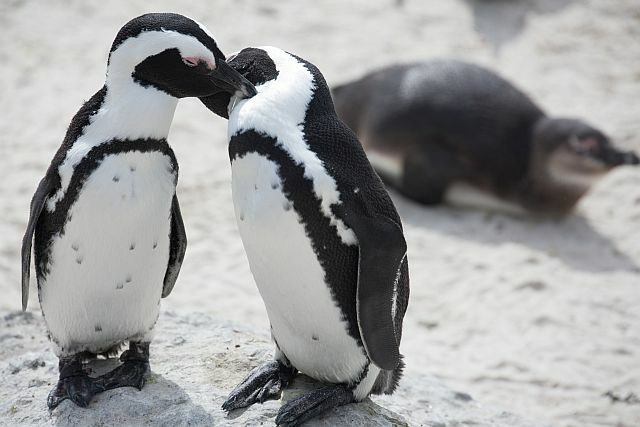 The island also has a bird center and sanctuary which is interesting to walk during spring and fall migrations but has birds landing all year round. Also nice all rear round are the island’s wonderful sunsets. When Chicago’s winter gets going that’s the time to head to the Morton Arboretum for an indoor miniature train exhibit and an outdoor husky sledding event or to the Chicago Botanic Garden to breath moist air in its greenhouses or enjoy Asian orchids. An Enchanted Railroad is zipping around at family-friendly height at the Morton Arboretum now through Feb. 19, 2018. Viewing is ticketed so if at the Arboretum during those days stop at the Visitor Center Desk to get a timed ticket. 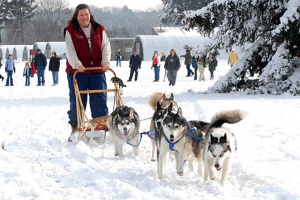 The event is weekdays from 10 a.m. to 4 p.m. and weekends 9 a.m. to 4 p.m.
Or go over to the Arboretum Jan. 27-28 between 11 a.m. and 4 p.m. to see Husky Heroes. Siberian dogs will be pulling sleds and posing for pictures. Demos are typically 11:30 a.m., 12:45, 2 and 3:15 p.m. Also visit Adopt a Husky. The Morton Arboretum is at 4100 IL Hwy 53, Lisle. For other information call (630) 968-0074 and visit Morton Arb. A favorite place for people in the know who can’t fly to warmer climes is the desert or one of the other greenhouses at the Chicago Botanic Garden. Others dress for the outdoors and exercise by exploring the Botanic Garden’s paths. Visit the greenhouses at the Chicago Botanic Garden for a breath of warm air. Chicago Botanic Garden photo. The Chicago Botanic Garden is at 1000 Lake Cook Rd., Glencoe. Work off holiday treats by ice skating. Or simply enjoy the outdoors gliding around a rink to a waltz or holiday music. The City of Chicago, its park district and The Park at Wrigley Field have ice rinks that are fun to skate. All you need to bring are your skates or rent them there. Look below the Bean (Cloud Gate) sculpture on the Michigan Avenue level between Washington and Madison Streets to join skaters on the McCormick Tribune Ice Rink, free of charge. Ice skate rental is $12 Monday-Thursday, $14 Friday-Sunday and holidays. Holiday hours: Christmas Eve, Dec. 24, 10 a.m.–6 p.m. (ice skating lesson at 9 a.m.), Christmas Day, Dec. 25, 10 a.m.–4 p.m. Dec. 26 – Dec. 30, 10 a.m.–10.p.m. (ice skating lesson at 9 a.m.), New Year’s Eve, Dec. 31, 10.a.m.–8.p.m. 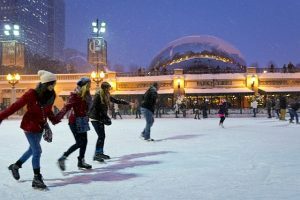 (ice skating lesson at 9 a.m.), New Year’s Day, Jan. 1, 10 a.m.–10 p.m.
Look on north side of Millennium Park at 337 E. Randolph St. to find the Maggie Daley Park Skating Ribbon. It really curves like a ribbon. Admission is free. Skate rental and regular hours are the same as McCormick Ice Rink except Sundays 10 a.m. to 8 p.m.
Holiday Hours: Christmas Eve, Dec. 24, 10 a.m. – 6 p.m., Christmas Day, Dec.25, 10 a.m. – 9 p.m., New Year’s Eve, Dec.31, 10 a.m. – 8 p.m., New Year’s Day, Jan. 1, 10 a.m. – 9 p.m. (During the holiday break, the Skating Ribbon will be open from 10:00 am – 10:00 pm, except for above dates). Skate in The Park at Wrigley, the public entertainment area that abuts Wrigley Field at 3637 N. Clark St. Opened Nov. 24, the 8,000 sq. foot ice rink will be open daily through Feb. 25, 2018. Entry is $5 ages 13 and older. Skate rental is $10. If there during the holidays stop at the Christkindle Market that opened this year for the first time in the Park at Wrigley. The park district operates several ice rinks. Its outdoor Warren Ice Rink at 6601 N. Western Ave. is already open as is the Maggie daley Skating Ribbon and the McFetridge Ice Rink which is indoors at 3843 N. California Ave.. Other rinks open in December depending on weather conditions. 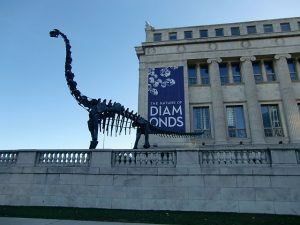 Click Chicago Parks for locations and hours.